We at The Church of Apple love Apple but even we have gotten a little tired of Apple’s restrictions, at least I have anyway. That is why I have jailbroken my devices. No, not to pirate apps or music but to be able to more with our devices in our everyday use. You can use different settings and tweaks and employ many themes. There are some OK themes, there are good themes and there are some that are fantastic and fantastic is what we have here. This theme, called OS X Pad, is available through the Theme Outlet (source: http://fnetdesigns.com/cydia/repo/) for $3.50 via PayPal. To me, this is the only Mac OS X theme worth the time. So, if you are a Mac user, or want a taste of the Mac OS on the iPad, then I will tell you why this theme is the only Mac theme to buy, perhaps the only theme to buy. The one thing that struck me about this theme was it’s ease of use and it’s beauty. First off, the theme comes with a slide to unlock screen that looks almost like a start-up screen on a Mac. Just a warm welcome to your new theme. Right after you leave the home screen, the first thing you’ll notice is the articulately detailed wallpaper, the same one that is used on the Mac. You can also change the wallpaper in the settings. As your eyes look down, you’ll see a dock that looks exactly like the one on the Mac. In the top left-hand corner you’ll see the Apple logo on a light gray bar and see the words “Finder”, “File”, “Edit”, “View” “Go”, “Window” and “Help”. Yup, you guessed it, this theme has a full fledged Finder Bar, just like the Mac. It even has the name of the user (you will set this up in the very beginning of receiving this theme) on the top right along with bluetooth, wifi, volume, date and time and the magnifying glass. You will see the overall “Mac-ness” of this theme. It absolutely is incredible. Going inside the theme, you will find that the Finder button on top left will prompt a window that looks almost exact to the Finder window on the Mac. 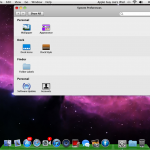 In it you will find folders that you can store apps in (just like Mac Finder) and a feature called quick links that allow you to go to that application that it says. There is an Applications folder that has all your applications in it and the other folders you have to add the apps themselves but is awesome once you do. Every app icon is enwrapped in a blue border and an tiny Apple logo on the bottom right. Also, the Finder window is draggable just like the window on a Mac. Also, when the Finder window is open, the Finder icon on the dock has a blue dot under it, signifying it’s open, just like a Mac. 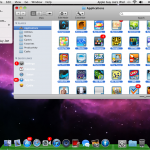 Moving on to the dock, you have exact Mac icons, such as Finder and Safari icons. When there are notifications for a particular app, it will show the same red dot with a white number in it. Moving on to the settings app, when you click on the Settings icon, it will pop up with a prompt box very similar to the one you get when you double click the settings application on the Mac. You are greeted with a series of options, including iPad settings and Theme Settings, clicking on iPad settings will bring up the Settings app but clicking on the Theme settings will bring up a window that looks very similar to the settings app on the Mac. Going up to the Finder Bar, you will find that it acts just as the Finder Bar on the Mac would. It looks and feels like a Mac Finder Bar and is just awesome. The design of this theme is very articulate and very complex, the best I have ever seen. One thing that this theme does that almost every other theme I’ve ever used can not, is preserve the functionality of the iPad. A lot of themes take away from the functionality of the iPad while quite the contrary, I think this theme adds to the functionality of the iPad. Now as we look at the function of the theme we will start where we left off in the Form section. In the finder bar, under the Apple menu, you have the option to restart, shut down, and log out (and yes these functions will actually do what they say but you have to download a tweak from Cydia called MultiBoot). In addition, from within the Apple menu, you can select “About this iPad” (instead of About this Mac) and will open a window telling you the basics of the iPad. Also, Software Update will open a Settings screen that will allow you to update the theme right from the theme, without having to leave it, which is really nice and adds to the functionality of the theme. There is also a button to open the App Store and a button to open System Preferences which will open Theme Settings. Now, the Finder menu has the ability to give you an “About Finder” window, Edit Finder Folders, which I will discuss in a minute, and Finderbar Preferences which allow you to customize the Finderbar as to whether you want it translucent, if you want a 24 hour clock, and if you want to use the Weather in the clock. The Edit menu allows you to go into desktop edit mode, which is the mode required in order to customize where apps/folders go, it allows you to change your wallpaper and it pulls up SB Settings. The “Go” menu will allow you to open The Theme Outlet, Cydia, Messages, Safari, Music, Videos and Contacts. The Help menu pulls down “OS X Pad Help” which, if opened, will give you information about how to use the theme and another with an option to contact the developer for support. Going to the right, you will see your username. Clicking on that will pull up the Accounts Settings window and from there you can change the Username. Also, clicking the Bluetooth button will evoke settings. The date and time button will prompt a pull down that will tell you the date and time and also give you the weather if you should so desire. One cool feature of the theme is that you can click on the magnifying glass on the top right and will pull up all of your applications. Unfortunately at this time, it does not have Launchpad but it will have it once the developer updates the theme. 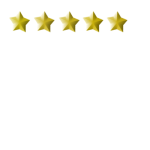 Once he does so, I will update this review to show so. Wow, that was a lot to take in. As you can see the FinderBar does many things and retains some of the same functionalities as the Mac FinderBar. Now, on to the Finder itself. As I mentioned earlier, the Finder menu is very clean and nice. On the left, there is a drop down menu called Places that lists seven folders. Applications being one them has all of your applications in one folder. The other six are completely customizable as to the names of the folders to the apps in it. All you have to do to add apps in is click on Customize from within the Finder window and then click on an empty space and fill it with an app. It’s that simple. 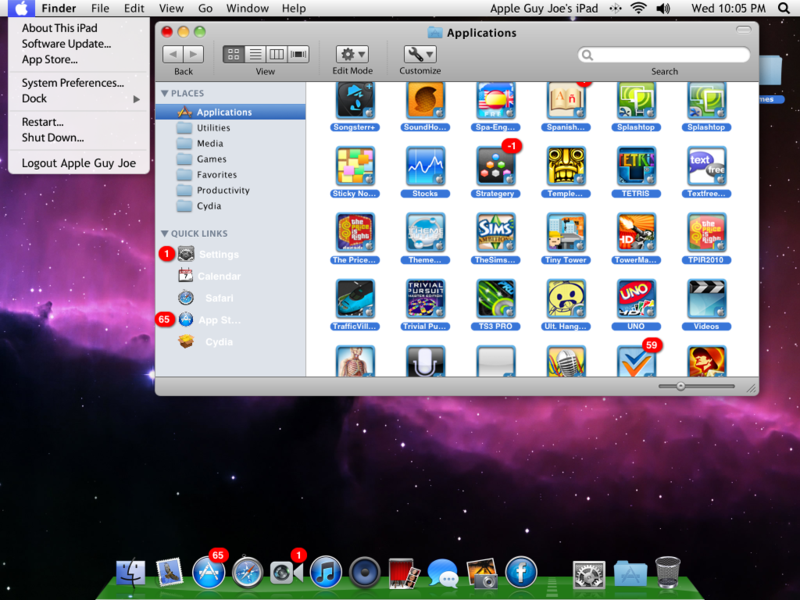 Going on to the Desktop Edit Mode, you have the option of putting 7 customizable folders which can each store 80 apps. That is more than plenty enough space to put apps into folders. Unfortunately, folders you make in Finder cannot be transferred over to folders on the desktop, which is a pain but may be a new feature in the future. You can also put up to 30 apps on the desktop (note that 6 of these 30 are folder spaces, so that would be 24 apps in addition to 6 folders). In the settings you can see that the theme is very customizable. 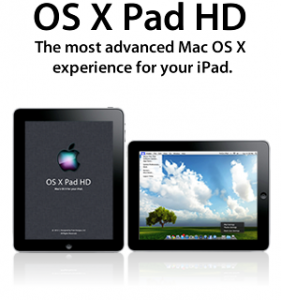 First, you are able to customize your OS X Pad with 70+ wallpapers that are wallpapers that Apple uses (including the stock Mountain Lion Space wallpaper). As for the Finder Bar, as I mentioned earlier, you are able to make it translucent, you can make the clock 24 hours and you can make it show the weather in the clock’s drop down menu. As for the dock, you can customize it with 10 icons. You can choose from some of the stock icons or even add your own custom icons. 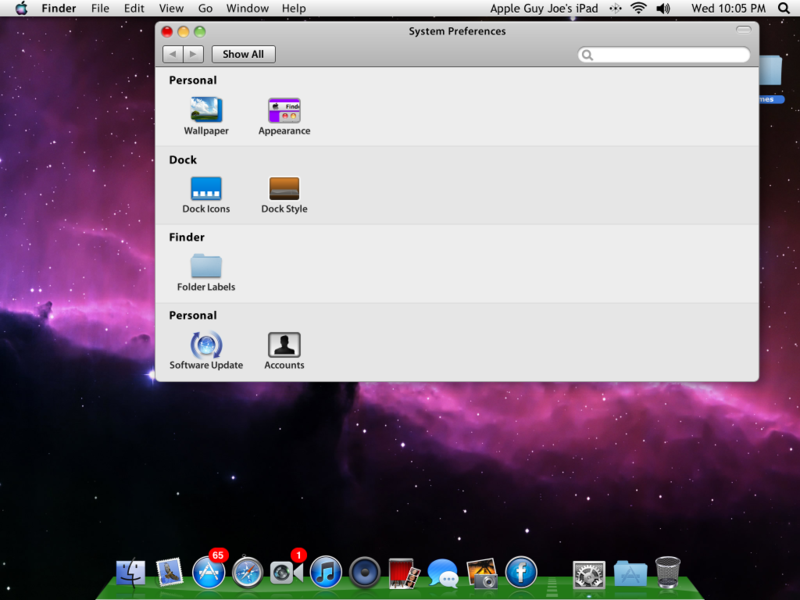 In addition to being able to add your own icons, you can make the customize the dock style from 25 different colors. As aforementioned, you can change the name of the folder in Finder. Here is where you can do that. Software Update is a feature that allows you to update the theme in-theme, just enter your PayPal email address and you are set. As for accounts, you can change the name of the User, the Username or whether or not you want the username displayed on the finderbar. As I mentioned earlier, this theme has become my primary OS. I only boot into iOS now to download an app or Cydia tweak or what not. It truly is Mac OS X on your iPad and I do not believe that any theme can match this theme, even non-Mac themes and there are a few reasons. But I won’t tell you those reasons. Instead, buy the theme and you WILL find those reasons on your own. 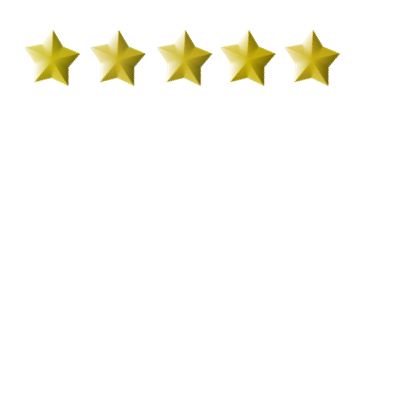 It is for the reason that the theme delivers in form and function that it earns a easy 5 star rating. Great Job Fnet Designs, I look forward to update 2.1 and I hope to remove. the few cons listed above.